Jambuvijay Maharaj Saheb (1923–2009), also known as Muni Jambuvijayji Maharajsaheb, was a monk belonging to the Tapa Gaccha order of Svetambara sect of Jainism.Jambuvijay was born as Chunilal Bhogilal Joitram in 1923 in town of Mandal, Gujarat. His father's name was Bhogilal Mohanlal Joitram (1895–1959) and his mother's name was Aniben Popatlal (1894–1995). He was born in a deeply religious family. His father took vow oflifelong celibacy in 1925 and was initiated as a Jain monk Muni Bhuvanvijaya in 1932. His mother took initiation as Sadhavi Manoharashriji in 1939 under her own sister Sadhavi Labhashriji. All of Jambuvijayaji's aunts were initiated as sadhavi's and there were a number of initiations in his mothers family. In Ratlam in 1937, at the age of 14 he took initiation as a Jain monk under his father, Acharya Bhuvanvijaya, who became his teacher. Later on he studied under Acharya Punyavijaya and assisted him cataloging various Jain manuscripts. 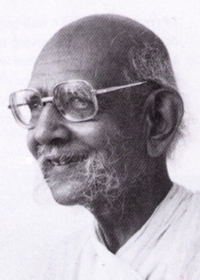 After the death of Muni Punyavijaya, he became the chief editor of the Jain Agama series. Muni Jambuvijayji was a polyglot and knew 22 languages. Among them were Sanskrit, Prakrit, Pali, Apabhramsha, Gujarati, Hindi, Tibetan and some others. There was a unique thing about Jambu Vijayji’s learning and teaching process. When he wanted to teach something to a scholar visiting him, he would seat higher. But when he wanted to learn something from the scholar, say a foreign language, he would make the foreign scholar seat on a height. It is Indian tradition that Guru always seats on a seat and a person who has come to Guru to learn something from him seats on floor. Jambuvijayji was so humble to seat on lower place when he wanted to learn something from a scholar visiting him. That is how he mastered about 22 languages - Gujarati, Hindi, English, Sanskrit, French, German, Sinhali, Tibetian, Japanese etc. Jambu Vijay Ji was not in favor of building new and newer Jain Mandirs here and there. He was also not in favor of throwing money during Varshidan procession. Once he said, Swami Vatsalya was meant to visit poor houses and distribute food or needed things there, so that really poor people would be happy and bless the Diksha ceremony. In typical Varshidan nowadays, only those who are powerful grab the money. Contrary to recent trend of urban savvy Jain monks, Shri Jambuvijay would always prefer to spend majority of his time in rural areas. He always preferred to halt in village so that large amount of visitors would not disturb him frequently in his reasearch work. He used to select a place where Jain Upashraya and Jain Mandir are located side by side, so that he and his mother would be able to have darshan every day in morning. In 2007, Italian scholar Michel stayed 2 months in a small village near Rann of Kutch to get authentic guidance for her study on Jainism from Shri Jambu Vijay Ji Maharaj who was staying there for Chaturmas. Michel became permanently vegetarian and started chanting Jain Navkar Mantra every day during her stay. Today Michell is in Italy, but she orders Gujarati Khakhara from Ahmedabad to continue her pledge of being vegetarian as there are few choices for vegetarians in Italy. To become vegetarian is next to impossible for a person born and living in country like Japan. But he was Jambu Vijay Ji who made a Japanese scholar Shin Fujinaga a vegetarian. Fujinata first met Jambu Vijayji in 1982 and he was frequent visitor to Maharaj Saheb in all these years. He has Jain monk’s daily usage objects there in his house in Japan. Fujinaga is actually a telecom engineer. He is involved in Japan Jain Sangh activities. Jambu Vijayji’s last foreign disciple Hiroko is still here in Gujarat.She is here for her scholarly work about Buddhist manuscripts. 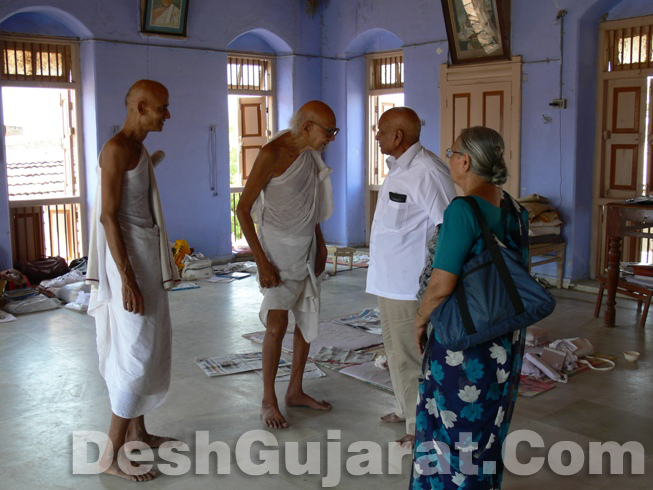 In last 10-12 years Shri Jambu Vijay Maharaj spent his Chaturmas(four-month period every year during which Jain monk would limit himself at one place) in areas around Shankheshwar. 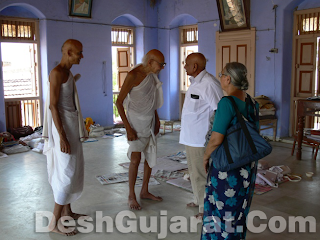 One place - Surel where his 3.00 pm discourse was attended by all the village people, most of them non-Jains. It was like shut-down in whole village to listen to Maharaj Saheb.He lastly decided to spend Chaturmas periods in villages of his Diksharthi disciples. His next Chaturmas was scheduled at Mandsor(Madhya Pradesh) as Namaskar Muni who died with him in accident was from Ratlam. His visited Dhanpura village in recent past for Diksha of a Rajput boy. As Dhanpura is located just 11 km away from Dethali, we requested Maharaj Saheb to visit Dethli. And he replied that for saisari people it’s easy to push accelerator of a vehicle, but for Jain monks, the life is on legs, and the monks have to do many important things. When Jambuvijayji visited Badrinath in northern Himalayan area, the military people stationed there were amazed to know how a person could walk 3,000 kms in old-age barefoot to Himalaya from Gujarat! He was known for his pioneering work in research, cataloging and translations of Jain Agamas and ancient texts. He was responsible for discovering and publishing many ancient Jains texts lying in different forgotten Jain jnana bhandaras). He was a disciple of Muni Punyavijay. Both Muni Punyavijay and Jambuvijay had worked all their life in the compilation and publication of our ancient Jain Agama literature and cataloging ancient Jain jnana bhandaras. Muni Jambuvijay was a scholar who devoted his entire life to critically editing the Jain scriptures. Prof. Dr. John Cort mentions the difficulties faced and the persistence shown by Muni Jambuvijay in ensuring that ancient manuscripts which were under lock and key were brought to light. Many bhandaras like the one at Patan were unopened for decades or centuries and Muni Jambuvijay had to often use his mendicant charisma to convince the trustee to open up the libraries. Shree Jambu Vijay Ji Maharaj, disciple of Shri Bhuvan Bhanu Ji Maharaj worked almost all their life in the compilation and publication of our ancient Jain Ägam literature. Many learned scholars worked under the leadership of Shri Jambu Vijay Ji Maharaj in the compilation and publication of Jainism’s most authentic literary treasure. The partial list of such scholars are; Muni Shri Dharmachandvijay, Late Pundit Shri Bechardas Doshi, Late Pundit Shri Amrutlal Bhojak, Late Pundit Shri Dalsukh Malvania, Dr. Sagarmal Jain, Dr. Nagin Shah, Late Dr. Harivallabh Bhayani, Pundit Rupendra Pagariya, Pundit Suresh Sisodiya, Dr. V M Kulkarni, and Dr. Vasudevsharan Agrawal. Scholars not only from Jain community but other communities as well are deeply shocked by sudden demise of such a towering personality.Jambu Vijayji was a moving University completely irreplaceable.